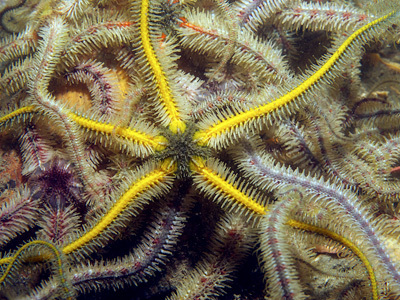 ECHINODERMATA : OPHIURIDA : Ophiotrichidae STARFISH, SEA URCHINS, ETC. 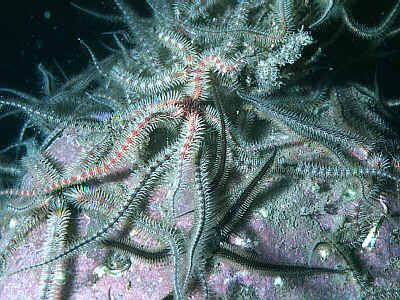 Description: A large brittle star with long arms. The arms are very bristly with seven glassy rugose spines on each segment. The disc is somewhat pentagonal and bears small spines on the dorsal surface. 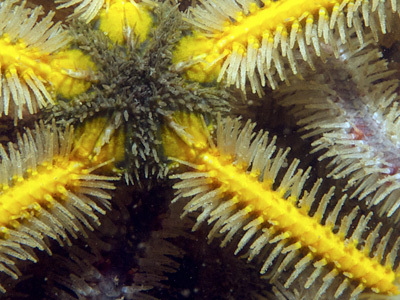 This brittle star is very variable in colour; red, yellow and orange patterned specimens occur as well as the more common brown or grey ones. The arms are usually banded with dark and light colours. 20mm. disc, arms 5x disc diameter. Habitat: Commonly found from lower shore to deep water as single individuals beneath boulders or amongst sessile animals, but also occurs offshore as dense beds with several hundred specimens per square metre. Similar Species: Ophiothrix luetkeni occurs in deep water off the western coasts of the British Isles but has small spines on the dorsal arm plates. Arm spines conical and thorny, articulated at the base. Picton, B.E. & Morrow, C.C. (2016). Ophiothrix fragilis (Abildgaard, 1789). [In] Encyclopedia of Marine Life of Britain and Ireland.